Three students from Dowdales explain about their planned trip to Tanzania in 2020, including how they plan to raise the money. They will be working on community projects to benefit local people. 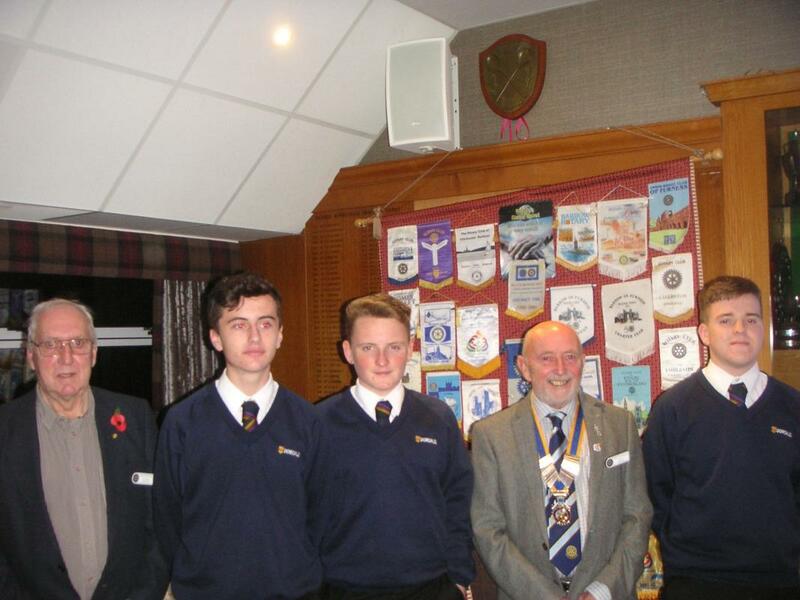 Our guest speakers this week (Wednesday 14th November) were three students from Dowdales School who are part of a group of 50 students from throughout the UK that have been selected to join the 2020 World Challenge to Tanzania. It is a challenging task they have before them, not only when they get to Tanzania but also beforehand. Each have to raise £3400 in order to take part ! Ben Pascoe, Adam Boyd and Fraser Rigg, who are also members of Crooklands Casuals Under 15 Football Team, decided that they would take a leaf out of their footballing and tackle the challenge as a team. Especially the fund raising ! Their first fund raising venture was a bag packing day at Dalton Co-op— there they managed to raise £600. They followed that up with taking part in the Coniston to Barrow walk and in September the three of them rode in our Tour de Furness, with 15 or so other fund raising ventures planned they certainly seem to have that aspect of the challenge in the bag. Kilimanjaro is their next objective, a three day hike and camping in the bush before scaling the highest mountain in Africa. As keen footballers and Ben is gaining his coaching qualification, they aim to develop a football pitch and to take with them kit from their Crooklands Casuals Team to donate and perhaps help enrich the lives of youngsters they come across by teaching them about football. They will also be working in schools during their stay and will be teaching English as well as soaking up the local culture. But it will not be ALL work, they will also get a chance to view the prodigious wild life in the area when they take part in a Wild Life Safari. No zoos here, but nature thriving in the wild. Finally a day or so to chill whilst waiting for the flight home in no less a place than Zanzibar ! …. And Kwaheri Tanzania ! Later in the year our club council will be discussing the project and hopefully will recommend that we help them achieve their goal with a donation to their cause. In closing the boys said that they would be very happy to come and tell us all about their great adventure when they return, something we will all look forward to. I think the boys had the longest question session ever, with lots of questions from a very interested audience after which Richard Johnston proposed a vote of thanks.